AP Ed.CET 2017 Phase-2/ Final PhaseCollege-wise Seat Allotment Allotment Details Results Counseling at @sche.ap.gov.in/EDCET Web Counselling Dates Certificate Verification dates, BEd Admissions Counselling Details, Web Options Entry Online AP B.Ed.CET Results, Rank Cards 2017 Download AP EDCET Results 2017 Check Online AP Education Common Entrance Test B.Ed. Result 2017, EDCET Counselling Dates @http://sche.ap.gov.in/EDCET, manabadi.com, schools9.com, eenadupratibha.net, sakshi.com . AP EdCET Entrance Exam Results 2017, AP EDCET Result 2017, AP B.Ed Results 2017, ap edcet Counseling Allotment Schedule. Andhra Pradesh State Council of Higher Education is known as APSCHE will organize the AP EDCET 2017 Examination on 06th April 2017 at various pre-selected examination centers across the state. Applicants those who have completed written examination will begin their search for Andhra Pradesh EDCET Result 2017/ AP EdCET Results 2017. Andhra Pradesh Education Common Entrance Test (AP Ed.CET) 2017 results will be released available today 8th May 2017 in the official website. Andhra University issued the AP Ed.CET 2017 Final Phase seat allotment orders for admission into (2)Two years B.Ed regular course in the Colleges of Education in AP State for the academic year 2017-2018. Eligible candidates were exercised web option final phase from 26.09.2017 to 28.09.2017 till 5.00PM .Allotments will be placed on the website on 29.09.2017 after 6.00 PM. Candidates shall invariably report at allotted college on or before 03.10.2017. The Common Entrance Examination for the students who have completed their Graduation Course was conducted for the academic year 2017-18 on behalf of Andhra Pradesh Council for Higher Education (APCHE).. Ed.CET Test is conducted in accordance with the permission of AP Govt. Colleges in Andhra Pradesh offers various courses in B.Ed by the Ed.CET score and rank. The Candidates can check their AP EDCET cut off 2017 and AP EDCET 2017 Result by entering their AP EdCET hall ticket number at official website and also from here available. Date of Exam: AP EDCET 2017 will be organized on 06th April 2017 at various pre-selected examination centers across the state. The qualifying marks for all except SC/ ST is 37 and for candidates belonging to SC/ST there will be no qualifying mark. AP Edcet 2017 convener Prof R Ranganathan said that of the total 8,785 candidates applied for the test, 7,152 candidates attended the test registering 81.4 per cent attendance. The merit list will be prepared on the basis of marks obtained and also ranked in Andhra Pradesh Education Common Entrance Test 2017. Where there is a TIE in the Total Marks, The Marks secured in Part-C will be taken into account to decide relative Ranking for the Candidates. In case of further TIE, the Marks obtained in Part-A will be taken into account to decide relative Ranking. The Rank obtained in Andhra Pradesh Ed.CET-2017 is valid for entry into B.Ed. Course for the Academic Year 2017-2018 only. 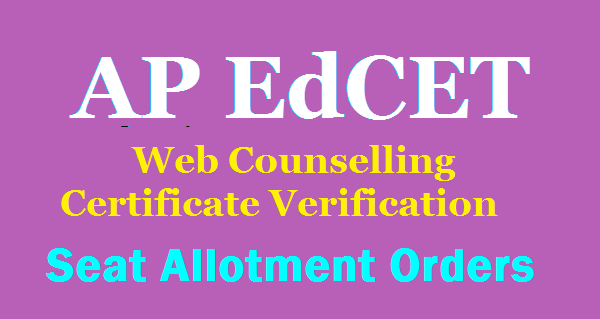 The Candidates who have appeared for the AP Ed.CET 2017 can down load their Rank Card for counseling process available in the official web site http://sche.ap.gov.in/EDCET .The result will be displayed along with the rank and download it take the printout for further reference. The counselling dates of AP EdCET 2017 for BEd counselling, results, rank cards available to download today. Search tags: apedcet 2017 results,edcet 2017 results,education entrance exam results 2017,ap edcet entrance test 2017 rank cards,au edcet 2017 results,apedcet.org results,ap b.ed admissions 2017, ap b.ed entrance exam results online ap b.ed results 2017 ap bed counselling schedule 2017 AP EdCET Entrance Exam Results 2017, AP EDCET Result 2017, AP B.Ed Results 2017, ap edcet Counseling Allotment Schedule, AP bed EDCET Result 2017, AP B.Ed Entrance Exam Results Online, AP EDCET 2017 Entrance Exam result 2017, APEDCET 2017 apsche result, ap bed counselling schedule 2017, ap bed seat allotment 2017, ap bed merit list 2017, ap edcet merit list 2017, ap edcet cut off marks 2017, ap bed entrance test cut off marks 2017, ap edcet rank card 2017, apedcet 2017 apsche result download.